The Los Angeles Angels had an unexpected visitor on the field during last night’s game with the St. Louis Cardinals. 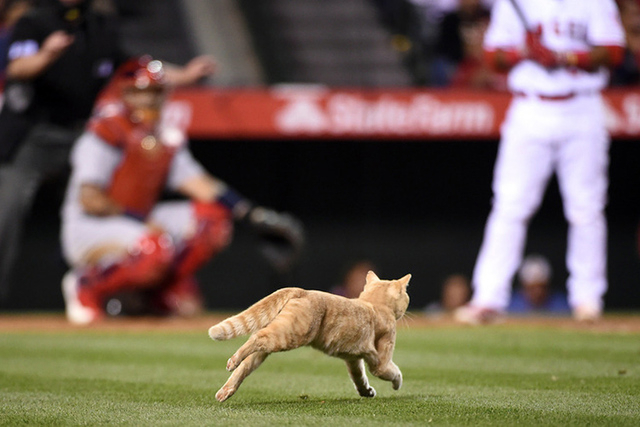 The Los Angeles Angels had an unexpected visitor on the field during last night’s game with the St. Louis Cardinals — a cat. Yes, a cat. A rather large cat, actually. In the bottom of the fourth inning, a cat darted across the field in front of the pitcher and into the stands. “There’s a cat on the field,” one announcer yelled. “Well, now I’ve seen it all,” another announcer said. A fan sitting in the front row was able to catch the cat as it ran through the stands. The fan sat down with the cat and tried to calm it down. And apparently that’s a first for Angels Stadium, according to one of the announcers. The evening ended with some good news for the cat. During the post-game broadcast, Fox Sports reporter Jim Hayes said the cat is one of a handful of stray cats that live at Angels Stadium. “I’m told by an official Angels spokesperson it has already been picked up by an animal adoption group and they will find it a good home,” Hayes said. In 1969, the Chicago Cubs were visited by a black cat, causing one more superstition among Cubs fans. The cat ran onto the field and walked behind Cubs’ Ron Santo, who was standing on-deck, and past the dugout. In the 1969 season, the Cubs posted a 92-70 record and at one point were in first place for a consecutive 155 days before losing 17 out of 25 games to end the season.